Rutgers students – What Exit? 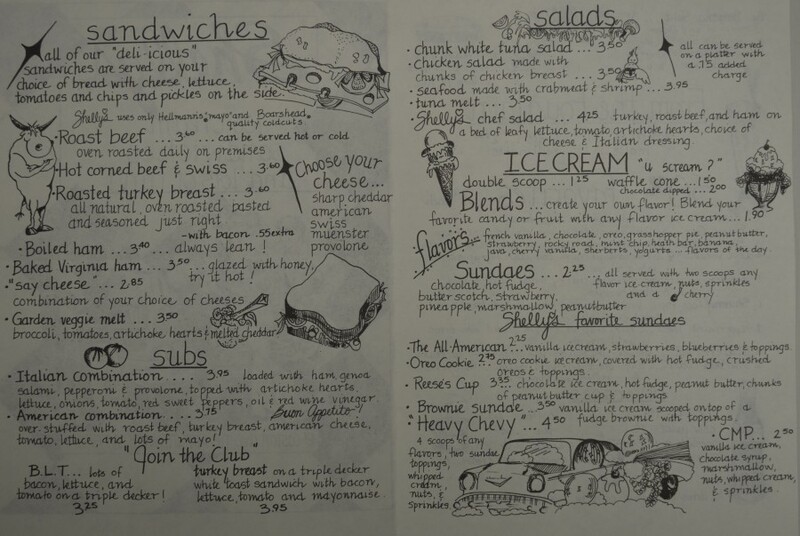 When it comes to eating, Rutgers students have always had plenty of options, from pubs and taverns to diners and ice cream parlors. Today, we’ve dug into our archives to get a glimpse of what Rutgers students in the 1980s had to eat. Shelly’s Ice Cream on Easton Avenue served sandwiches, subs, and most importantly, ice cream sundaes and milkshakes. Students really craving ice cream could order the “Heavy Chevy”: four scoops of ice cream, two sundae toppings, whipped cream, nuts, and sprinkles! Shelley’s Ice Cream, 1980s. Sinclair NJ Restaurant Menu Collection. And students looking for Sunday brunch only needed to look to Stuff Yer Face for egg, bacon, or mushroom stromboli–or perhaps a frittata? 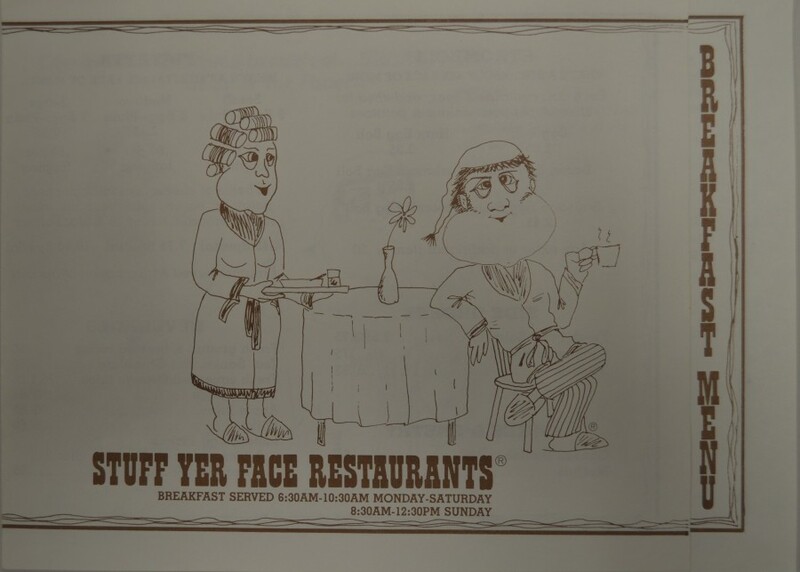 Stuff Yer Face, 1980s. Sinclair NJ Restaurant Menu Collection. The Rusty Screw Tavern offered standard pub fare along with live music and film screenings. 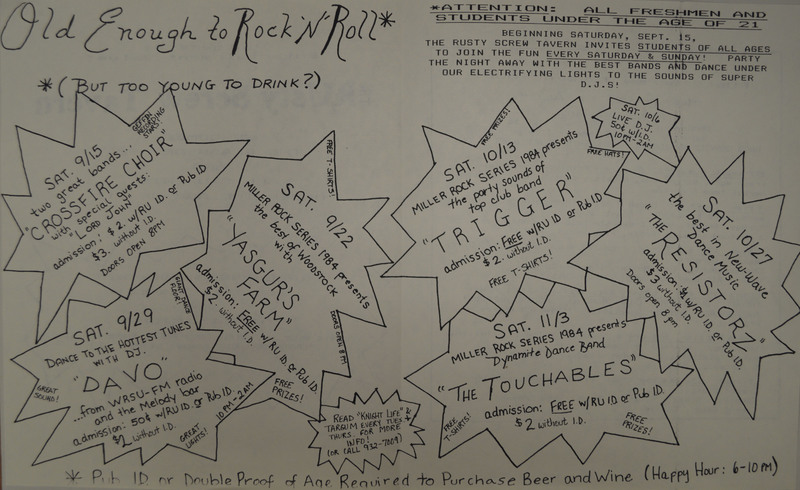 In 1984, the restaurant welcomed the Rutgers class of 1988 to campus with a free concert, featuring the new wave band The Resistorz. The Rusty Screw Tavern, 1984. Sinclair NJ Restaurant Menu Collection. Later in the semester, students could stop by the Rusty Screw for a screening of The Rocky Horror Picture Show or The Big Chill.